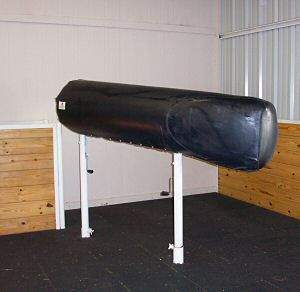 The Breeder's Choice contour equine breeding phantom (breeding dummy, breeding mount, or phantom mare) has a contoured body allowing ease of access with the A.V. during collection. 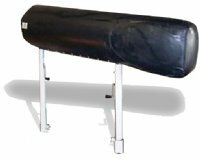 The contour phantom body (shown in picture) is 7' long and 21" in diameter. The regular breeding phantom is 6' long and 20" in diameter and has no cut out. The phantom cover is made of ballistic nylon with a softer, more comfortable fabric that increases the aesthetics and durability of your Breeder's Choice Phantom. Only available in black. The front and rear legs have an independent height adjustment system. Height and angle adjustments to the breeding phantom can easily be made by one person. The angle is adjustable from level to around 20 degrees. We recommend that you set the height of the mounting end at the approximate height of a mare that your stallion would breed. Assembly is simple! Individually the legs and body are completely assembled. After the leg sleeves are set in concrete, you will only need to attach the legs to the body. This requires only one bolt per leg and the bolts are included in the shipment. See Phantom Installation Instructions for complete instructions. Breeder's Choice warranties their phantoms (excluding the cover) for 2 years. Shipping charges will not be included in the total. We will contact you with the charegs due to special fretight rates. Most rates are between $250-$350 if no special requirements needed.